Just a little chilly this morning, but then again it’s mid-December. Still, we hope the cold is over soon and we return to the 70’s. 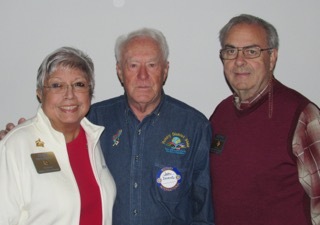 Notwithstanding the temperature, we stalwart Marana Rotarians gathered again at Nana’s Kitchen for our weekly meeting, which was called to order by President Mary Straus. Our Treasurer extraordinaire Lynne Himmer wanted to be sure that everyone knew that tax credits to organizations serving the working poor must be made by Dec. 31. And Vanessa Ruiz gave an update on the family we’ve “adopted” for Thanksgiving and Christmas. They’re doing well, and Vanessa is planning to go shopping for them this coming Friday morning (Dec 18). Today two fairly unusual events happened during “Happy Bucks.” Don Jorgensen auctioned off two seats to the upcoming UofA basketball game against UNLV. Dan Contorno won the bidding against Randy Brooks, who still insists that he has not one red cent to his name. And Maeve Johnson’s Happy Buck was, in lieu of the traditional dollar bill, four quarters. Each quarter was presented with something of a flourish, accompanied by recognition of someone that gave Maeve happy thoughts. Now that’s different! Rotary Club Board and Club Foundation Board meetings, 5:30pm at Jo’s. Our last regular Club meeting of 2015. No Club meeting, but possibly a social in the evening. Maybe. Not sure. We'll see. According to Harold Burtzloff, boxes from this year’s Boxing for Troops project have started to arrive in Afghanistan! And in other news, Dan “Mr. Money” Contorno will be holding another Texas Hold ‘Em Charity Poker Tournament to benefit our club. That’s Friday Jan 22, 2016, folks, at the Vision Church in Marana. We’d like to say this is how to have fun with your boots on, but that would be a whole different story. ​ John Rulan from the Saddlebro​oke Rotary Club brought us up-to-date on a joint project with our Club and other Rotary Clubs, “Quality Drinking Water for Everybody.” He was accompanied by two fellow Rotarians who have also been active in the project, Tom Turriff (project originator) and Mark Miller (interpreter and traveling diplomat). This is a joint project with the Nogales Rotary Club in Mexico, described as a small Club that does amazing things. George and Alice Rigney have been working hard on this project from our Club. John, an engineer by trade, began by pointing out that the two main problems in poor countries are shelter and water. Of the 110 schools in Nogales, 8 have received water filter installations, and a total of 22 schools will be included in the current grant. The cost is about $2000 per installation. Maintenance of the filter systems is also included in the grant. Tom added that Nogales is struggling with infrastructure, due to a population surge from the south. The problem is that there is no revenue stream associated with the influx of people. Mark commented that water problems are also a source of social problems, including ostracizing and bullying. And so, when water becomes a more plentiful resource, a certain degree of social stability returns as well. John finished up with praise for Engineers Without Borders, whose website says: Engineers Without Borders USA builds a better world through engineering projects that empower communities to meet their basic human needs and equip leaders to solve the world’s most pressing challenges. Our 15,900 members work with communities to find appropriate solutions for water supply, sanitation, energy, agriculture, civil works and structures. Marana Rotary thanks John, Mark, and Tom for a terrific project!